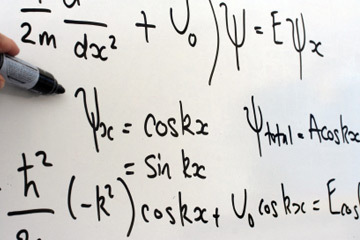 Quantum Physics may seem complicated to understand. It is. The reason is not because of the math or science involved (even though that could be hard to grasp), it's because of the unbelievable philosophical implications that arise out of understanding it. Niels Bohr, a renowned physicist and author of Copenhagen Interpretation of Quantum Mechanics once said, "Anyone who is not shocked by quantum theory has not understood it." One of the basic premises of the quantum theory of light, is that it is dual in nature. Light sometimes behaves as a wave and sometimes as a particle (or photon). Before quantum theory, the understanding of the universe was that it was made of both solid particles and waves. The particles were the building blocks of solid objects; the very smallest units of matter (like electrons) were particles. Waves, on the other hand, were not solid. Waves were what "sound" and "light" consisted of. Scientists then discovered subatomic particles. Subatomic particles were known to be part of a wave packet. A wave packet looks like a wave, but it is more concentrated, like a little ball of energy. Then physicists tried to ask questions about the wave packet or wave-particle. They realized they could not ask both questions at once. So, when they measured the wave-particle's location, it became a particle in a fixed place. When they measured the wave-particle's momentum, it became a wave moving through space, with no fixed location. Light is an example of a phenomenon that behaves this way. This confused the scientists and they did many experiments to learn more. In the research they found that until someone decides to measure a wave particle, it is both a wave and a particle simultaneously. A famous thought experiment, created by physicist Erwin Schroedinger, illustrates the point. Imagine you have a closed box. The box contains a cat, a bottle of cyanide held by a lever, and a wave-particle. If the wave-particle becomes a wave, nothing hits the lever and the cat is fine. If the wave-particle becomes a particle, then the particle will hit the lever and knock the cyanide bottle over, where the hungry cat will eat it and die. Quantum physics tells us that before we look in the box to see what happens, the cat is simultaneously dead and alive. It is the observation alone that causes one or the other possibility into reality.